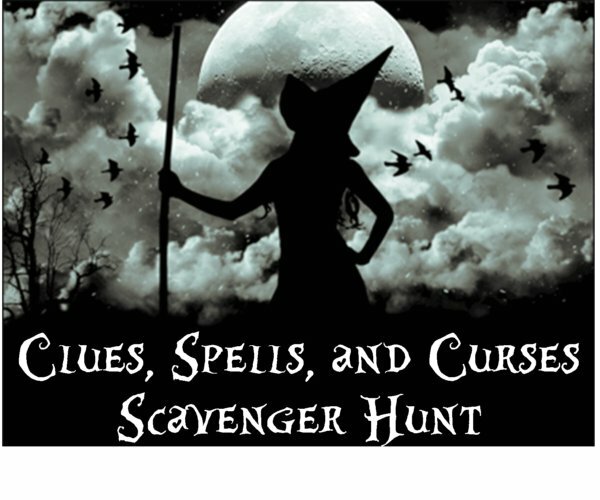 The Halloween scavenger hunt "Clues, Spells, and Curses" is a unique party game that goes beyond your typical scavenger hunt game. 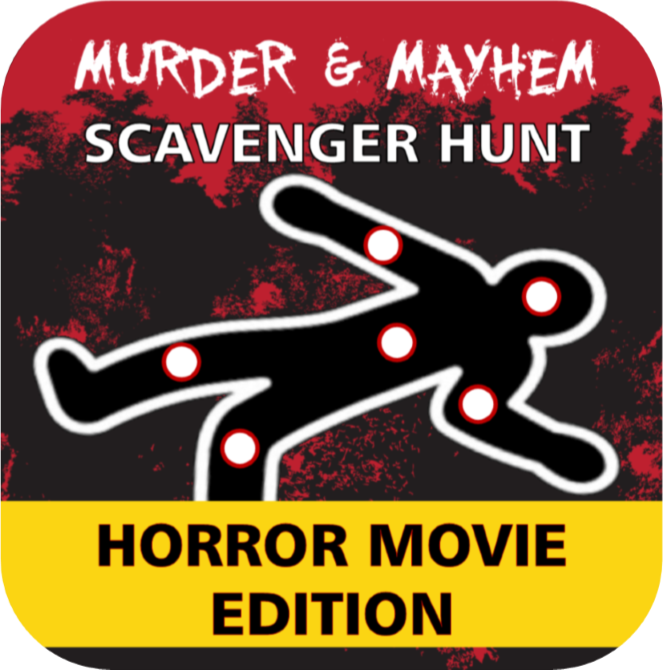 This Halloween party game combines all the fun of a murder mystery party game (minus the murder, lame scripts, and complicated set-up),treasure hunt and scavenger hunt together to create one of our most unique and popular hunts. 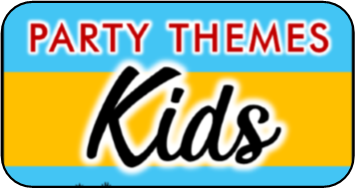 AGE RANGE 7+ This party game may be too hard for younger children (reading is required) but it is perfect for groups, older kids, tweens, teens, and even adults. Search for spells and the magic ingredients to break curses that their teammates are under. 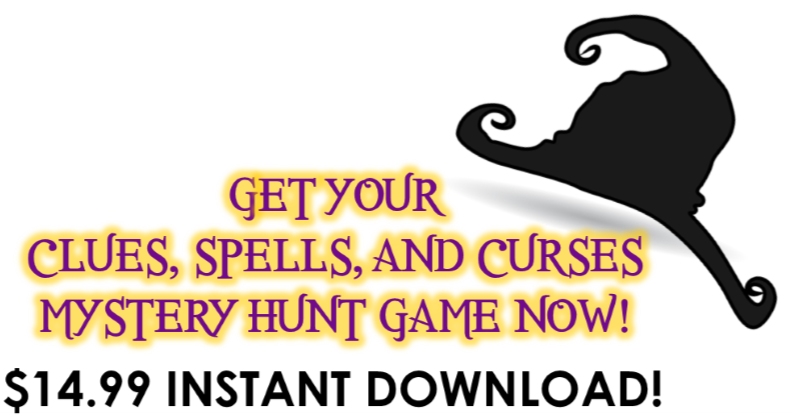 Use game money to buy, bribe, and borrow clues, spells, and potions from the other team. 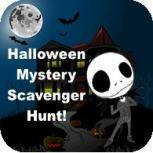 When guests arrive they will each be given a rule sheet and will be shown the first scavenger hunt clue. 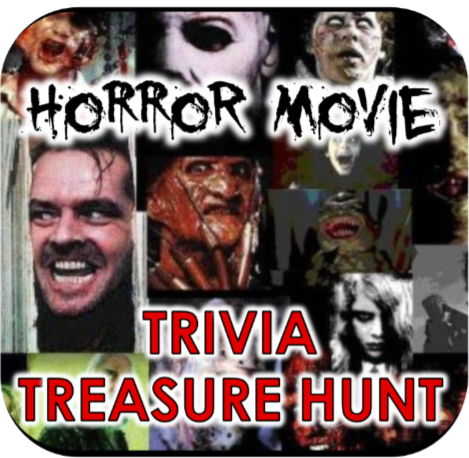 This clue is a letter that explains the story line of the game (click here to read) . The story goes that there was once a witch on this land (the place where you’re hosting the party) and that her spirit is trapped here. She was once notorious for leaving terror in her wake by casting humorous curses on others just for her own entertainment. Now she’s up to her old tricks, this time as a disgruntled spirit! Someone must put a stop to this madness, but trying may lead to guests getting cursed themselves. After the introductions guests divide into teams. 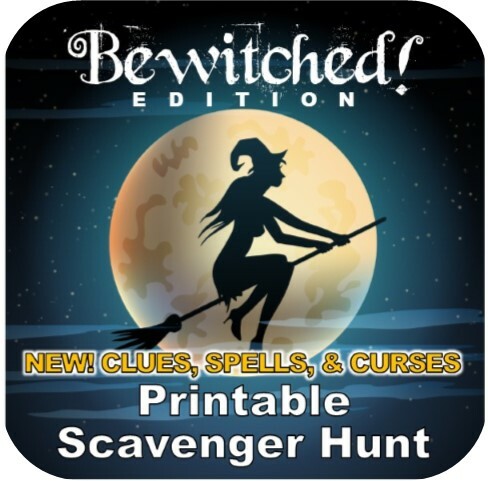 Each team is given an allotment of money for the game, and must search for the rest of the scavenger hunt clues that will help them figure out how to banish the witch from the world forever. 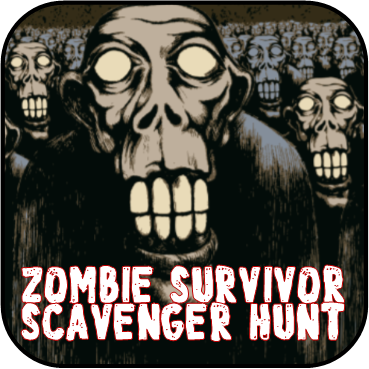 SCAVENGER HUNT CLUES: All the scavenger hunt clues will challenge players in a different way with puzzles, brain teasers, riddles and more. Clues are hidden all over the place and it is up to you and your team to find, collect, and figure out what they mean. If you find a clue card you may keep it for your team. You may later share or trade it for something else you need. You are not allowed to destroy any clue or other item that you find. REVERSAL SPELLS: You are not permitted to break your own curse, but you can help other break theirs. To do this you must find (hidden among the clues and curses ) the spell for reversing the curse. To use the spells you must have all the magic ingredients needed for the spell. 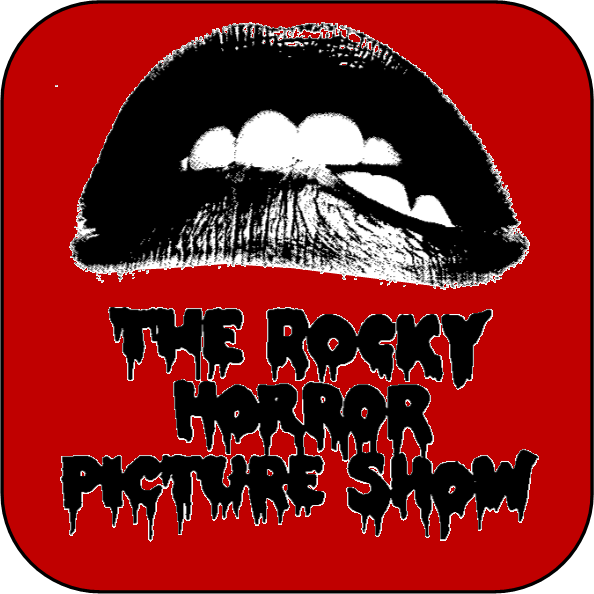 To cast the spell and break the curse you will need to follow the rules on the spell and complete it in front of at least 1 witness. A witness is someone who is not on your team. It can be the host or a member from the other team. 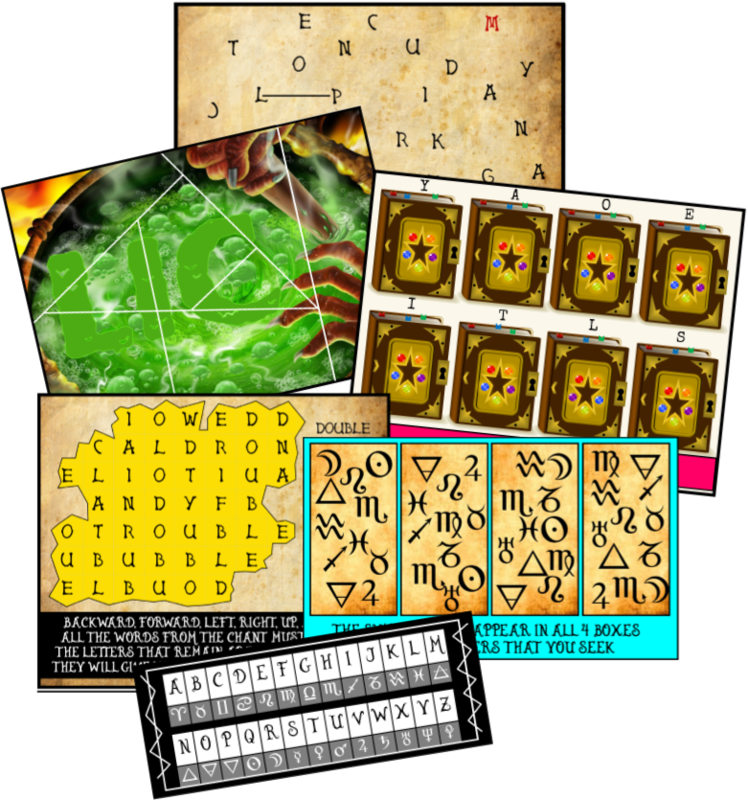 Included are ten reversal spell cards and four editable reversal spell cards. MAGIC INGREDIENTS: You will also be trying to find and collect magical ingredients. 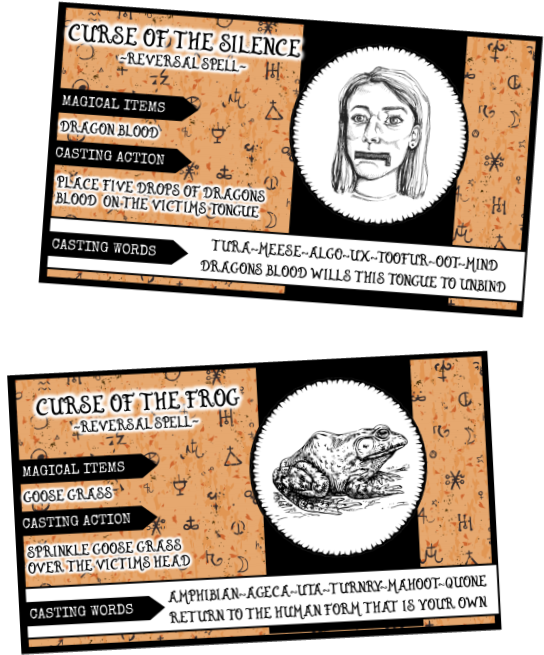 These are magical items needed for casting spells and breaking curses. Each one will have a label on it marking what it is. Wand of Nim: a stick about a foot long. 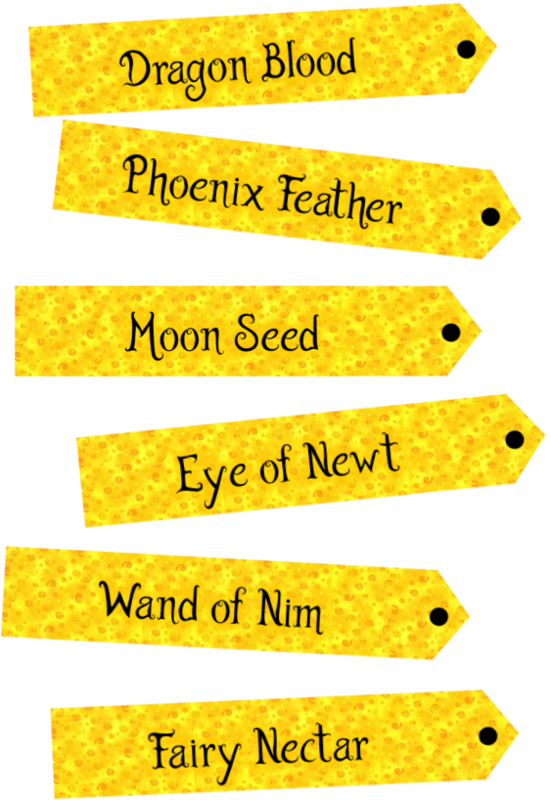 Attach Wand of Nim label. Dragon Blood: This can be red Kool-Aid or juice placed in a closable container. If you use a bottle remove the old label and replace with dragon blood label. Using a container that contains a eye or medicine dropper is fun, but unnecessary. 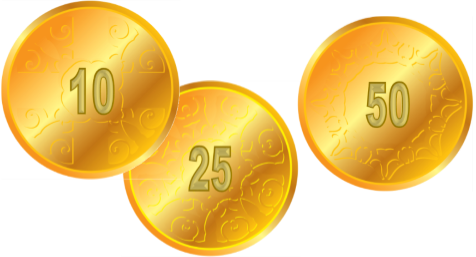 TOKENS: The money can be used to buy information, clues, cures, ingredients, etc during the game. You can use and spend your tokens in the game ANY way you like. The only rule is you are NOT allowed to steal it from each other. Hosting and setting up this game is soo easy. You are given everything you need for the game minus a few ordinary household items that you will use as magic ingredients ( items like water, salt, grapes, etc) , envelopes, and any prizes you want to purchase to use for rewards. 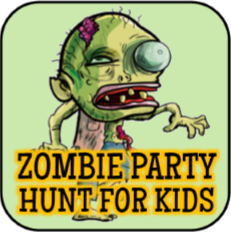 The printable set comes with instructions and setting up the game is as easy as hiding all the items and getting your guests pumped to find them. Game comes with complete step by step instructions on how to play from start to finish. Once the game is set up you won’t have to do anything at the party but watch , mingle with your guests, and enjoy. Complete Step by Step instructions on how to set up, host, and play the game. 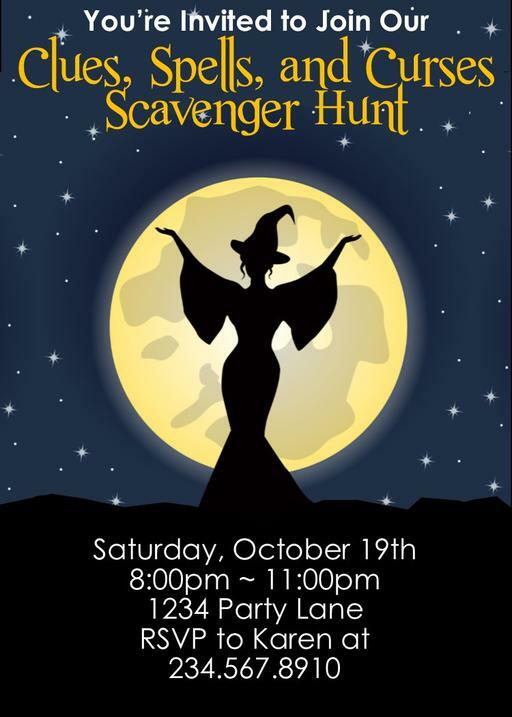 9 scavenger hunt clues that will help you discover the witch's name and win the game. 1 Mystery Letter to set the tone for the game and get guests excited for the game. 10 hilarious curse cards. This is the part of the game that is going to have your guests in stitches. 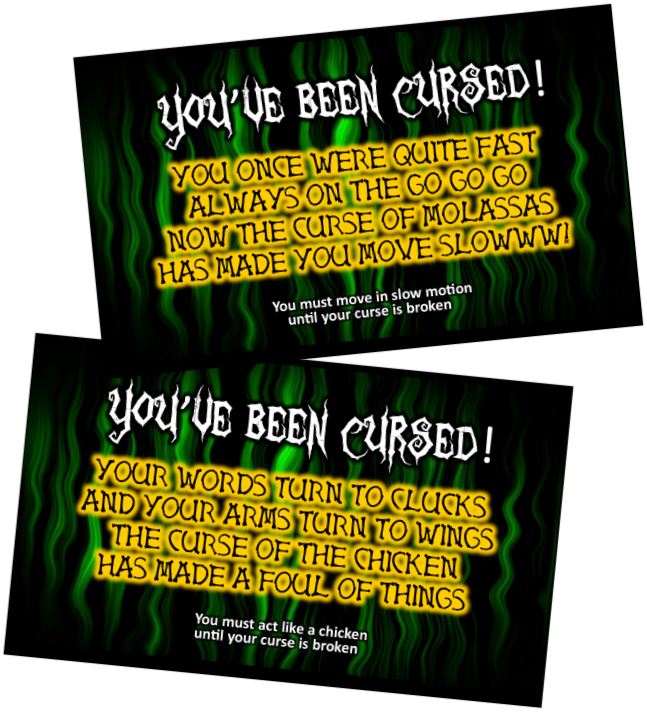 The curses are fun and silly. Your going to have a ball watching players act as they become “cursed”. 10 reversal spells Every curse must be able to be broken. The reversal cards have the ingredients you need to collect in order to break the curse, along with the magical words needed to repeat. 8 Magic Ingredient labels. These help turn regular items you have such as grapes and salt into magical ingredients. Simply attach the label to item and voila! 2 sheets of Game tokens This element of the game really helps guests get creative mingling and bartering with each other. 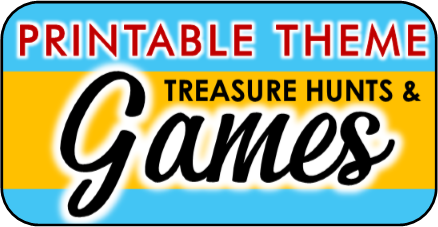 Rule Sheet: To give to your guests at the beginning of the game explaining how to play. This invitation comes 2 per page. To personalize open in adobe reader and replace default text with your own - simply click and type. Then print as many as you need for your event.